Move over Gordon Ramsay, there’s a new Master Chef in town. 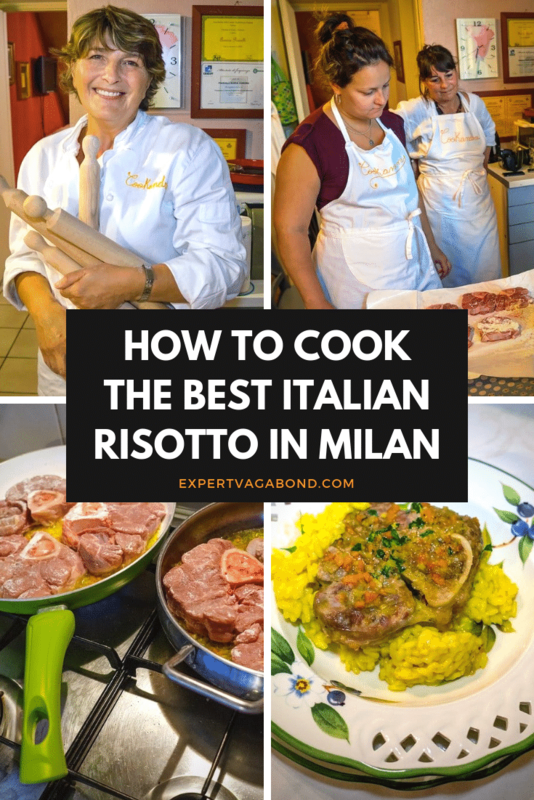 Join me in Milan as I learn how to cook up some authentic Italian Risotto Ossobuco. One of my favorite things about international travel is the chance to overcome new challenges and break out of my comfort zone. After many crazy adventure travel experiences like hitchhiking across America or cage diving with Great White sharks, my zone is slightly larger these days. Yet there are still activities that give me anxiety. Like cooking. Hey, if you want to taste the best turkey sandwich on the planet, I’m your man. But for anything else, forget about it. I’d rather whip up something fast and filling then spend hours in the kitchen creating a culinary masterpiece. 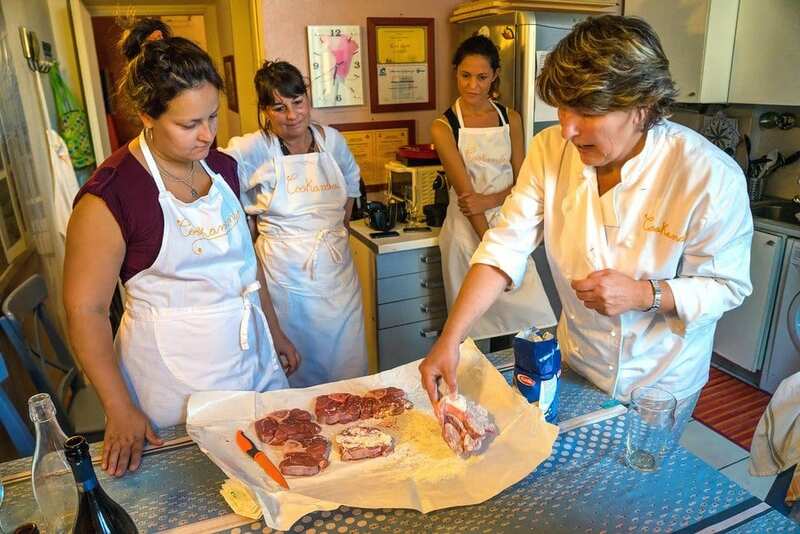 Ready to try something new, the plan was to take cooking lessons in Milan. I would attempt one of the most challenging Italian dishes there is too. Risotto. Risotto is a traditional Northern Italian dish, and a common way to cook rice in Italy. It’s a creamy & tender mixture made from a starchy medium-grained rice called Carnaroli. 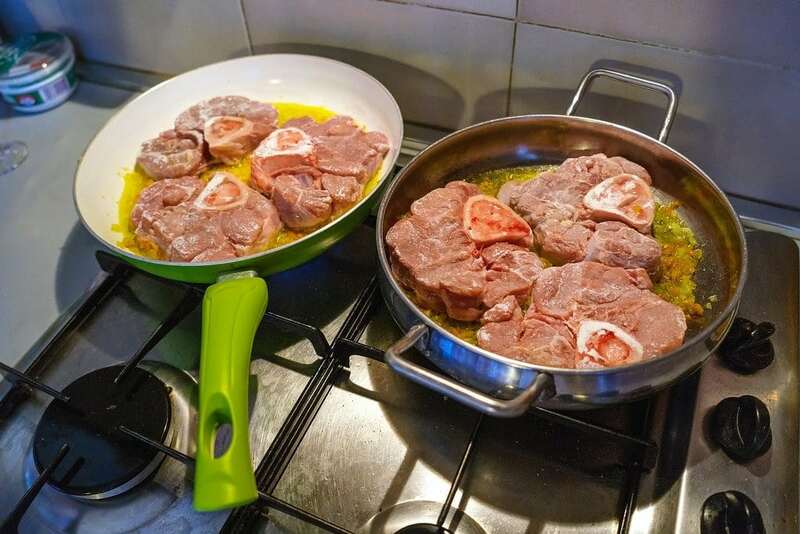 While risotto is often served as a first course, tonight I would be preparing the more substantial Risotto Ossobuco alla Milanese, a savory main course famous in Milan that includes veal. 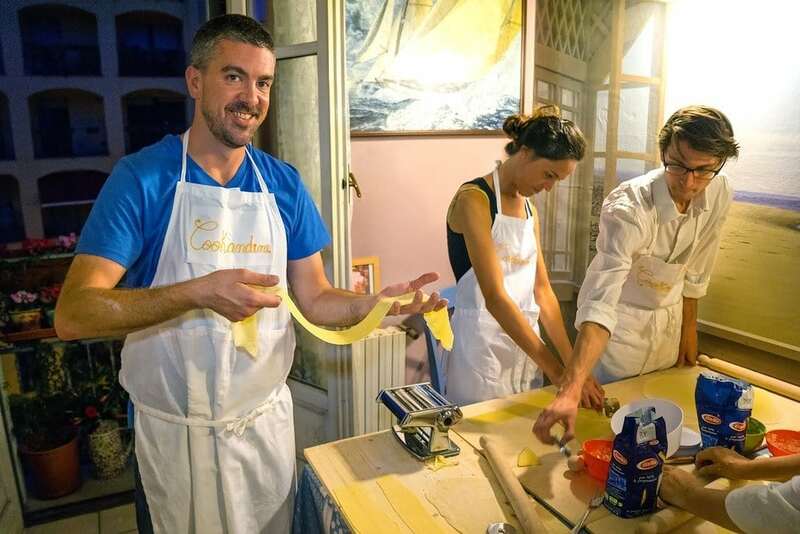 For a second course we would also be preparing Cappellacci di Zucca, homemade ravioli pasta filled with pumpkin. Luckily I wasn’t alone for this scary Italian cooking adventure. Joining me in the kitchen were my friends Matt from the United States, Julia from Russia, and Simon from Italy. We were invited into the home of local Milanese residents Aurora & Claudio. Aurora was a long-time professional chef who now runs Cook & Dine. 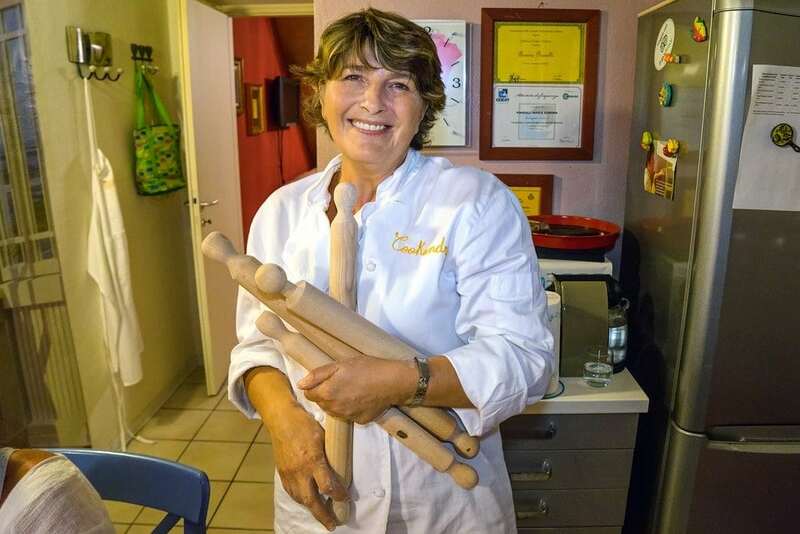 She absolutely loves teaching Italian cooking to hopeless tourists like us, and believes food is a way to bring people together from different countries around the world. Ok, so maybe I was the only hopeless one in the group. Everyone else had a lot more cooking experience. But I was determined to give it a shot anyway. So why is cooking risotto so difficult? Because the rice needs constant attention. You can’t just throw water & rice in a pot and let it cook by itself. The rice must be lightly toasted first, then broth is slowly added every few minutes, allowing the rice to absorb it before adding more. All this while constantly (yet lightly) stirring the mixture to loosen the starch from the outside of the rice into the surrounding liquid, creating a smooth creamy-texture. It’s more science than cooking really! After helping to chop up the ingredients, and cook the meat, it was my job to stir and watch over the rice while ensuring it was cooked to absolute perfection. Fill a pot with 2 liters of cold salt water, a celery stalk, onion, and peeled carrot. Add beef on the bone and leave it on high heat until boiling. Then let it soak for 3 hours on low heat. Remove meat and vegetables from the pot and strain the broth. In a saucepan, melt butter and add chopped onion to let fry. Add the rice and toast it for a few minutes, pour in white wine and let it evaporate. Add saffron. Moisten mixture with meat broth constantly until cooked al dente (slightly firm). When the rice is ready, turn off the heat and stir in butter and parmesan cheese. Cover the 4 veal shanks with flour on all sides. Finely chop the celery, carrot, and onion to fry lightly with butter and olive oil. When browned, add the veal shanks, let them cook on both sides for few minutes. Add white wine and let it evaporate. Cook the meat for about 2 hours, and add some broth if it is sticking to the pan. Spice with salt & pepper. When it’s ready, turn off the heat and sprinkle on a mixture of chopped parsley, garlic, and grated lemon peel. After slaving over the hot stove for hours (ok, maybe not that long) and rolling pasta by hand, we were rewarded for our hard work with an authentic Italian feast. Sweet Pumpkin Ravioli, creamy Risotto Ossobuco, fresh sautéed mushrooms, a giant cheese plate, and mountains of chocolaty tiramisu for dessert. Italians really know how to eat. What’s your favorite Italian food? Have you ever cooked risotto before? Share with us in the comments below! 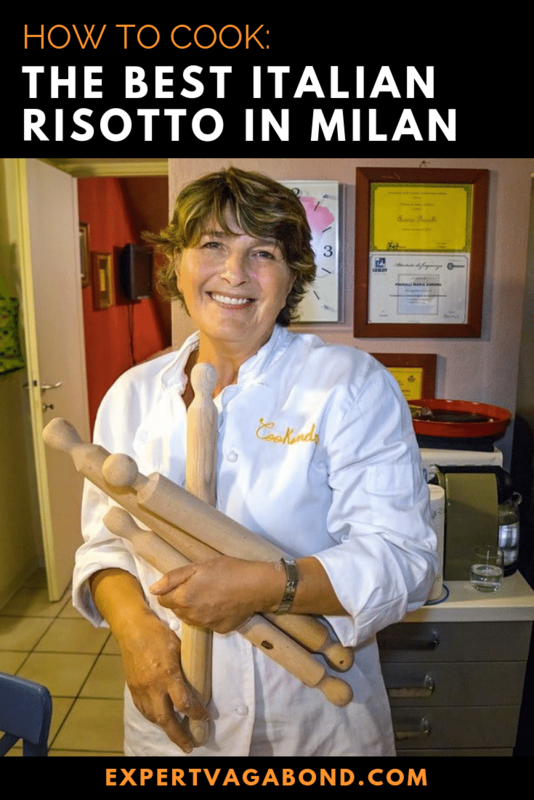 #Blogville is in partnership with Lombardy Tourism, Emilia Romagna Tourism, and iAmbassador. Content & opinions are entirely my own. Risotto is one of the tasties dishes to be found in Italy. The rice is actually cultivated in Lombardy, the Lomellina region mainly. You may actually see the fields from the motorway that runs around Milan! Looks great! Italian food is the best! I love it! In our Tuscany holiday we ate very much and very good!! Yes! I’m no cook, but it’s nice to know how to make a few dishes well. My grandmother was true Milano Italian, who emigrated to the USA in the late 1800s. She cooked and no one was ever allowed in the kitchen with her. When she died, she took fabulous recipes with her and I wasn’t smart enough to beg her recipes from her. What I miss the most, was her ravioli. I was just a little kid, but I remember boiling water with a fowl in it. Her ravioli? She made it fro. Scratch only one time a year and it had meat in it, but I don’t know what. In the end, it turned out to be soup with a small dash or two of Parmeson cheese and parselry flakes. I wish I could 1) get that true NorthernItalian recipe, and 2) find another Bianchi in Milano, Italy. My grandfather was Antonio Bianchi. Got any help? Hi Cheryl, I go to Italy several times a year and got a lot of Italian friends, the one u mention with soup could be ” Tortellini in Brodo”, popular from Tuscany all way up to Northern Italy. My best friend last name is Bianchi, family from Varese and Tuscany, she and her mom cook this at X’mas eve but Tortellini in Brodo is popular all through the year. Hope it helps! I am very jealous – that risotto looks delicious! I’ve had my favorites dishes while traveling through Italy. Start with the best ingredients and you’ll likely get the best results. Nicely done! Dear Louis I am Aurora the chef hosted Mattew to make risotto. 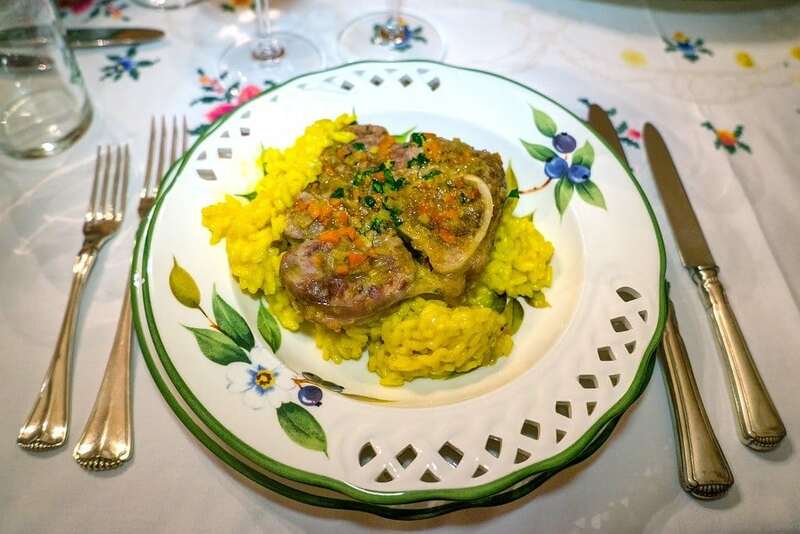 The lemon skin is not on risotto but it’s part of “gremolade” a mixture of parsley and lemon skin to top the meat ossobuco. Buon appetito from Milan! Cooking gives you anxiety… this coming from the guy who’s ridden the tallest swing is pretty funny. Ossobuco is one of my absolute favourite dishes! I’ll take heights over a stove any day — will leave the cooking to you guys. However it was fun to try. It looks like you had so much fun doing this – and with that volume of food inside you no wonder you needed some help getting home haha. I hate veal but I love risotto, and I’m never tried to cook it because I’m basically convinced I’ll stuff it up. I’m definitely a put-the-rice-in-the-pot-and-walk-away kind of girl. I didn’t know risotto needed such attention though – sounds like it’s definitely a dish to set aside time for and lovingly slave over. I didn’t realize it was such a process either. Those Italians take their food pretty seriously!